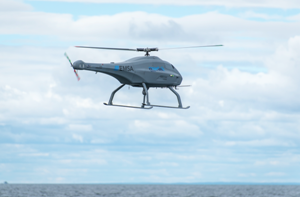 See the latest UNO development - a compact, low cost, single drum winch for both gliding and special purpose applications. We have developed a detailed advice sheet explaining parachutes, strops, traces and components to assist our customers. Go to the 'Safety, Technical Updates and Bulletins' section on our website to see more. 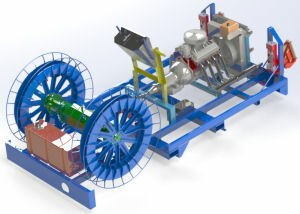 We are designing and manufacturing a new concept specialist winching platform system for Lindstrand Technologies. We have moved into improved facilities, next door to original premises, which will help us modernise using an improved stock control system. 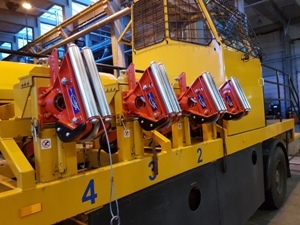 We can now increase our stocks to reduce supply times for winches and components. 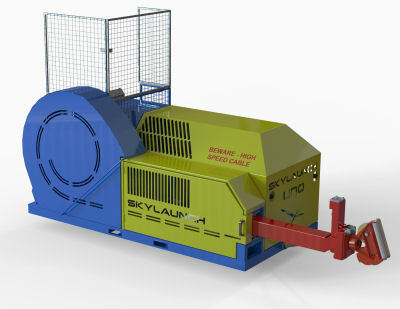 A new Skylaunch EVO Twin Drum Winch is being manufactured for EBNM Namur in Belgium, powered by LPG. 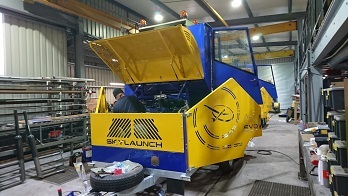 A new Skylaunch EVO Twin Drum Winch is being manufactured for Lasham Gliding Society Ltd, powered by LPG. 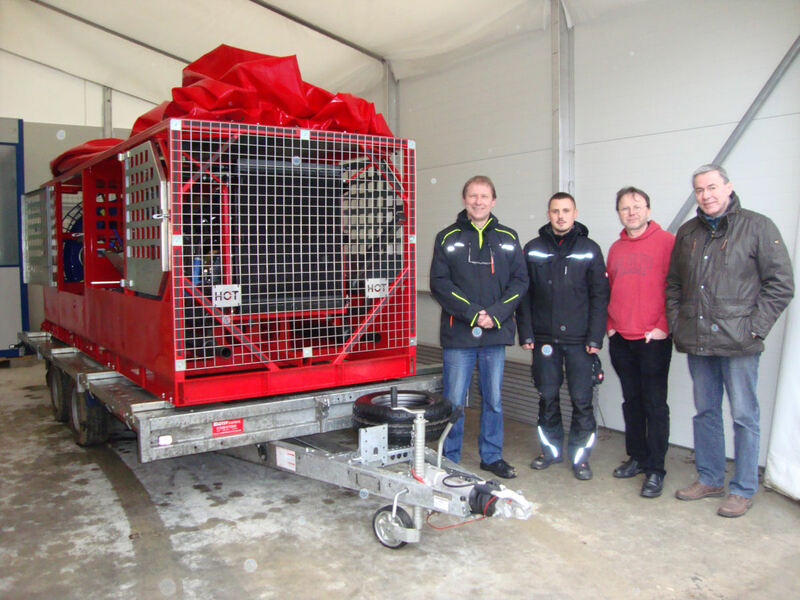 A new Kit winch was delivered to Hamburger Verein für Luftfahrt e.V. Germany. 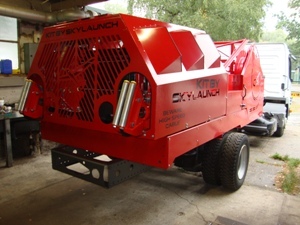 The Club will build this winch onto their lorry and when finished, Skylaunch will return to commission the winch and give full training in operation and maintenance. A fully re-engineered winch was delivered to Kehl Gliding Club in Germany, including full training in operation and Maintenance on site. 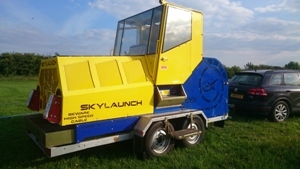 A new kit Skylaunch winch was delivered to Luenen Gliding Club in Germany. The Club will build this winch onto a trailer and then we will return to commission the the finished winch and give full training in operation and Maintenance. 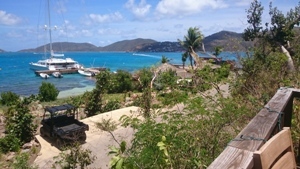 Mike Groves from Skylaunch was asked to be the Chief Engineer on Moskito Island (owned by Sir Richard Branson) in the British Virgin Islands (Caribbeans) while their regular chief Engineer was away. 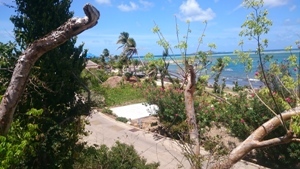 There are several hundred staff working on Sir Richards Islands (Necker and Moskito) so it was a very busy time as the Islands were damaged in the hurricane last year. 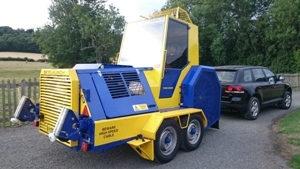 We now offer winches with Triple Silenced Exhaust systems for airfields where noise can be an issue for nearby residents. This system ensures launching operations are very quiet. They can be fitted to new winches or supplied as an upgrade to older winches. This latest version of the Helikite launch winch system was completed and delivered to North America (unfortunately it's exact application is classified). 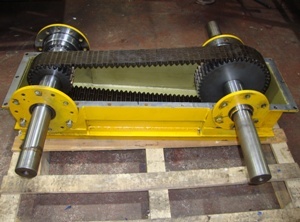 Two new special high speed winch assemblies were designed and manufactured for an overseas customer. These units have interchangeable level wind gearing for different size cables. 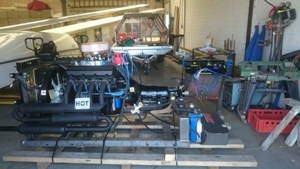 A new Evo twin drum winch(8.2 litre GMV8 LPG engine) using Dyneema cables was commissioned with pilot and winch driver training at the Southern California Soaring Academy at Crystalaire. With SCSA's kind help the winch was also towed to the SSA Convention in Reno for display and was very popular in the hall. Many thanks to all the people who visited us there. 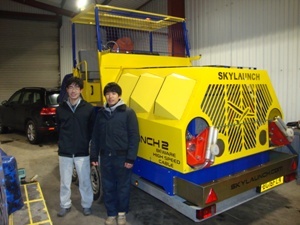 A new Evo twin drum winch (6.6 litre V8 TDi engine) using Skyrope cables was commissioned for the Meiji University Gliding Club in Japan, and their personnel came over to Lasham for training, before the winch is shipped to Japan. 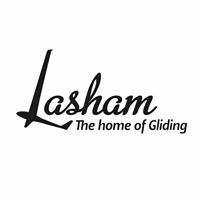 (Many thanks to Lasham Gliding Society for their help with this winch program). January 2018 - SSA Reno - First US Skylaunch winch exhibited! Skylaunch will be exhibing our world beating Evo winch from the Southern California Soaring Academy at the SSA in Reno this year. Please come and see us at booth 6 on the 1st - 3rd March. There is growing interest in kit winches for clubs wanting nearly all the benefits of a Skylaunch winch system but at a lower cost. It also encourages team working projects for club members on non flying days. A new design for a small winch was commissioned, designed and built by Skylaunch for UNICEF. This winch will be used on UAV / Drone aircraft for making much needed Vaccination drops on the Vanuatu Islands in the South Pacific. 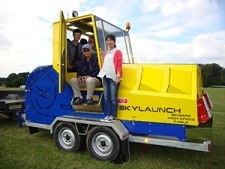 Meiji University Gliding Club in Japan have now placed an order for a new Skylaunch Evolution glider winch, with a folding roof to fit into their hanger. This winch will be fitted with Skyrope launch cables. Allsopp Helikites have ordered a new design Skylaunch Special Project winch with a V8 engine and large capacity cable drum, for Zurich University in Switerland. 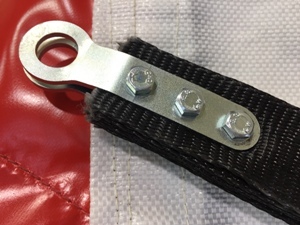 Following a design review, Skylaunch now supply all our popular Aerochute parachutes with a compact metal eyelet connection for ease of use and durability. 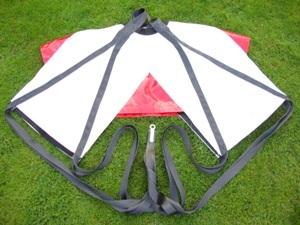 The Aerochutes, as with all our Parachutes, are available in lightweight, hard wearing Poly woved white "Hessian" material as well as Red, Yellow, Blue and Orange PVC. A new Evo twin drum winch (8.2 liter V8 LPG engine) using Dyneema launch cables. It was commissioned for Ron Greg from the Southern California Soaring Academy at our local Staffordshire club in England, before shipping to the USA. Pilot and winch driver training in California are planned for later this year. Many thanks to everyone who came to visit us at our stand this year at Aero 2017. 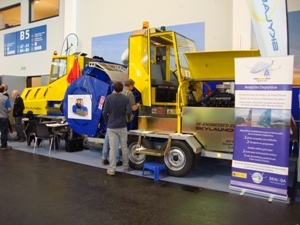 We exhibited 1 new and 1 re-engineered winch at the busy Aero Show in Friedrichshafen. New model lineup for 2017. One exciting new model and updates to existing models gives us this latest lineup for 2017 - The EVO, The ECO and the new UNO. New UNO, single drum design winch using many of the EVO's proven components at a more affordable price. For clubs with a tight budget but still has around 80% of the launch rate of a twin drum model and gives the fastest possible launch rate when used with a retrieve winch. 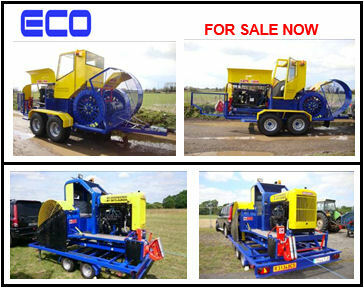 New ECO winches availability - A selection of twin drum, fully engineered winches are available for sale now. Download the latest spec sheet / price list. In addition to the extensive range of upgrades, parts, spares, repairs an re-engineering we offer for all non Skylaunch winches, we now offer an upgrade to fit Skylaunch pulley / roller units to Mel / Van Gelder winches. These proven design pulley / roller units are suitable for use with Dyneema or steel launch cables and can help extend the life of the cables. 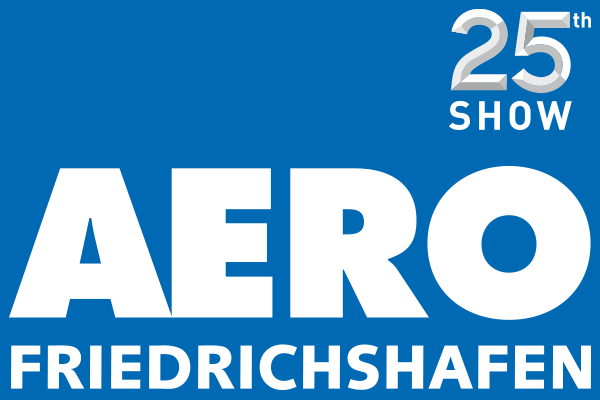 We will be exhibiting again this year at Aero 2017 from the 5th April to the 8th April. Please call in and see us in Hall B5 - stand 005. 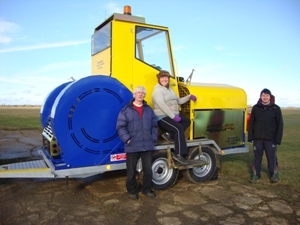 A Tost winch, fully re-engineered by Skylaunch was delivered to Cambridge Gliding Club. This winch is fitted with a 7.4L GM V8 fuelled by LPG, and is using 5mm Dyneema launch cables. 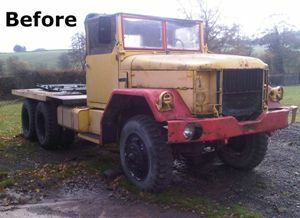 Pictures show the winch before re-engineering and after. 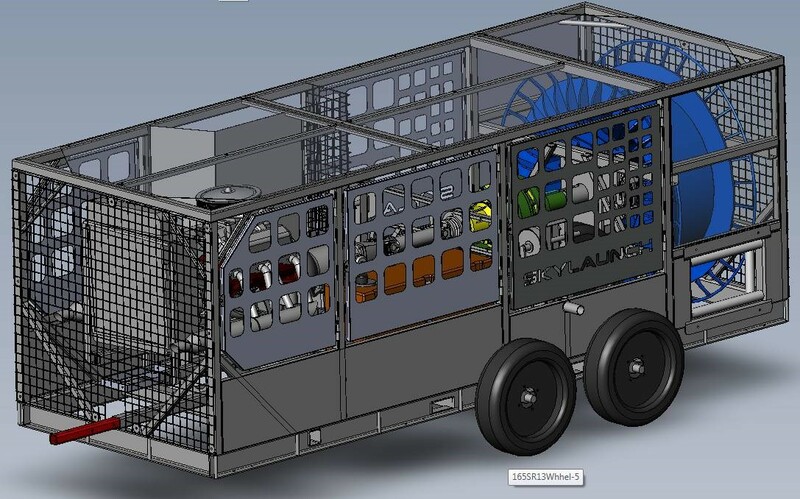 Allsopp Helikites have ordered a new design Skylaunch Special Project winch with a V8 engine and extra large capacity cable drum, for operation in Germany. 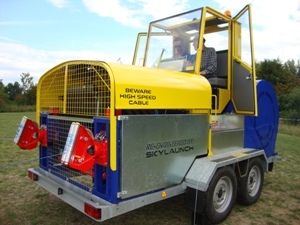 A Tost winch, fully re-engineered by Skylaunch is currently being built for Cambridge Gliding Club. 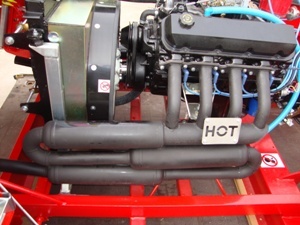 This winch is fitted with a big block GM V8 engine fuelled by LPG. A 1954 REO 6x6 truck is restored at Skylaunch. 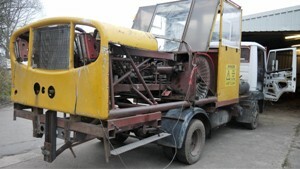 An old Tost winch was mounted on the rear of this truck until it was scrapped, leaving the truck with very low mileage. 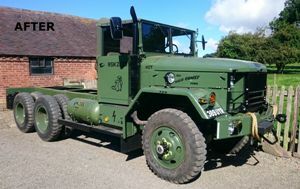 As it was too good to scrap, it has been lovingly restored and converted to run on LPG. 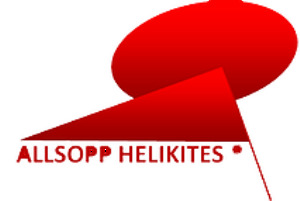 Special winch is delivered to Allsopp Helikites (see July news below). 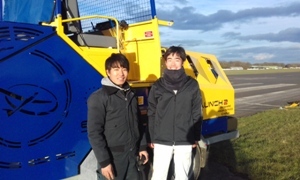 Four people from Waseda University visited Lasham Gliding Society (England) for training with their new Skylaunch Evolution winch before it is shipped to Japan. Allsopp Helikites have ordered a new Skylaunch winch for modernising the communications systems and upgrading to digital in the far East, due for delivery at the end of August. 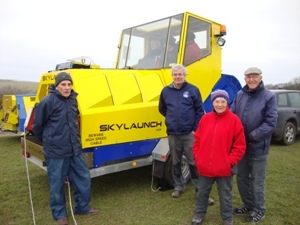 Buckminster Gliding Club's (Saltby Airfield) Skylaunch winch (1999) has been fitted with various upgrades, including automatic tow-out brakes, repairs and new paintwork. This winch is using Skyrope cables. 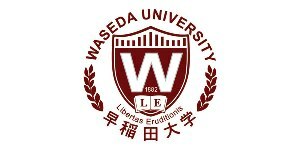 Waseda University have ordered a new Skylaunch Evolution twin drum winch (8.2L V8 Petrol EFI) for delivery in August. Representatives from the club will travel to the UK in mid August to undergo training on their new winch before it is shipped to Japan. This winch will be fitted with 1400m long Dyneema cables. 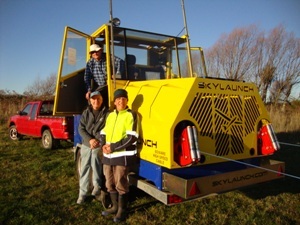 The new Skylaunch Evolution twin drum winch (8.2L V8 Petrol EFI) has now arrived at Wellington Gliding Club, New Zealand. Mike Groves and Simon Adlard flew out to give winch and glider pilot training, and would like to thank everyone at Wellington Gliding Club for their kind hospitality. This winch is fitted with 2500m long Dyneema cables. 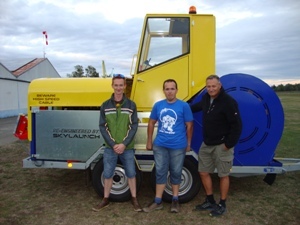 A Tost winch, fully re-engineered by Skylaunch was delivered to Ballenstedter Aeroclub e.V. Germany. This winch is fitted with a new V8 engine fuelled by LPG, extra wide low ground pressure wheels, and is using Dyneema launch cables. A new Skylaunch Evolution twin drum winch (8.2L V8 Petrol EFI) was packed into a container and is now on its way to New Zealand. 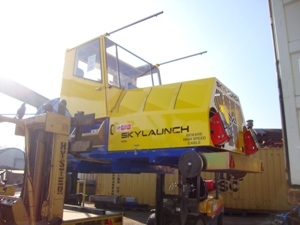 Skylaunch will be flying out for winch and glider pilot training once it arrives. 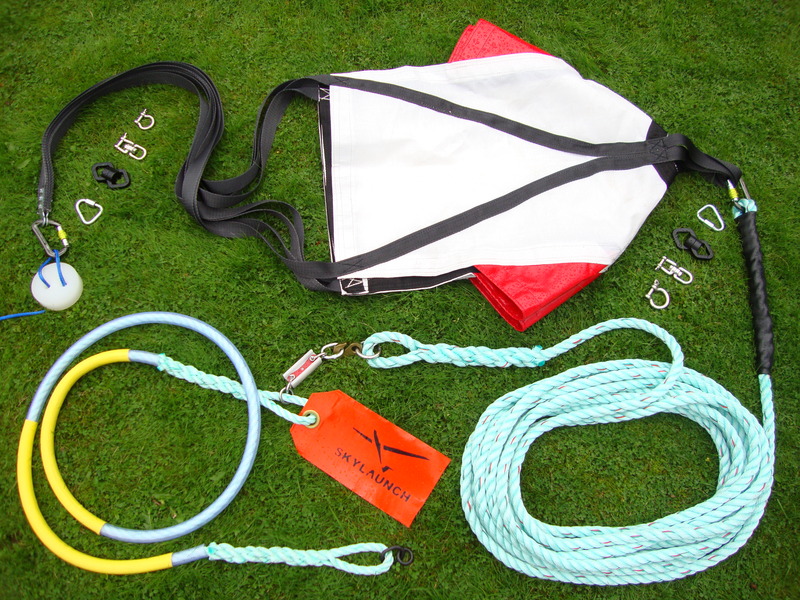 This winch is fitted with Dyneema cables. 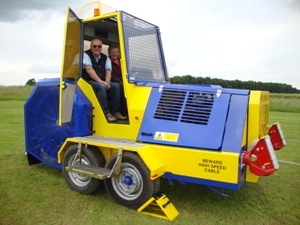 A new Skylaunch Evolution twin drum winch (8.2L V8 LPG) was delivered to BWND GC at 'The Park'. 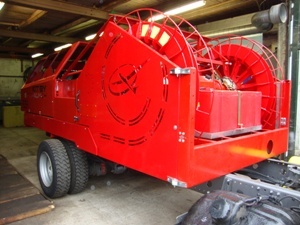 This winch is fitted with Skyrope launch cables. The original winch from RAF Bicester has been in operation for 17 years and over 150,000 launches. Now it has returned from filming on the latest Bond movie, it has been upgraded including automatic tow-out brakes, pulley roller boxes and a paintwork respray. This winch is using Dyneema cables. 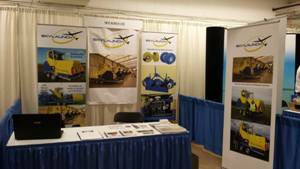 Skylaunch were pleased to welcome many visitors to our stand at the Soaring Society of America Convention in Greenville, South Carolina. Many thanks to all those who came to see us. 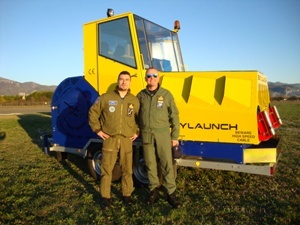 A new Skylaunch Evolution twin drum winch (6.6L V8 turbo diesel) was delivered to the air base at Guidonia near Rome and their personnel were trained in operation and maintenance. This winch is fitted with Dyneema cables.